When it comes to living room paint colors, we’re seeing bright, bold, and rich colors everywhere! It’s a look that brings life into a space adding vibrancy and energy that especially comes with color.Even though you can achieve this look with a wide range of colors, there’s a tendency toward cooling blues and greens: sapphires, emeralds, and peacock take center stage. But, you’ll also see many people use aubergines, mustards, and hot pinks. – Do paint your large to medium sized rooms a single dark color. A dark color will make a large open space feel intimate and cozy. 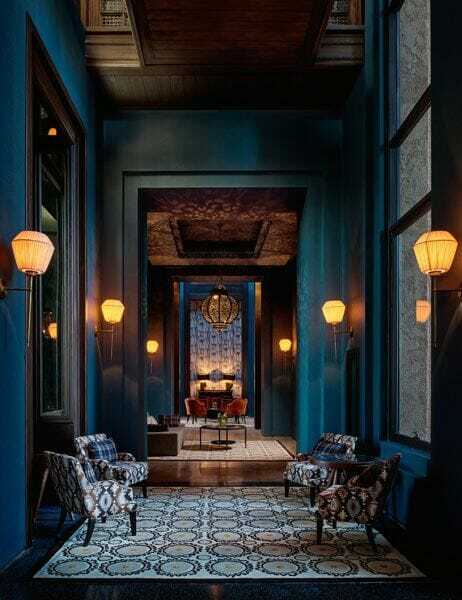 Check out this inky indigo treatment done floor to ceiling at the Royal Palm in Marrakech, Morocco. The room actually has a pretty minimal foot print but the ceiling could create a vacuum of dead space above the seating arrangement that could make the room feel cold and uninviting. The dark colors pull the space in and make the room inviting and warm. – Don’t paint every wall of your teeny tiny rooms in dark shades. What worked well in the room above will shrink small rooms into claustrophobic little coffins. It’s sad, but true. See the next tip for how to incorporate saturated hues in your small spaces. 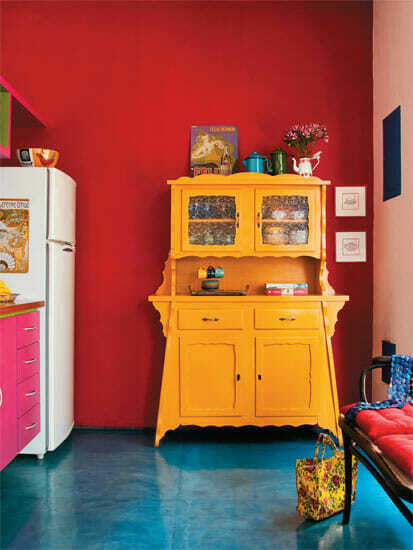 – Do paint a single wall of your tiny space with a bold, saturated hue. 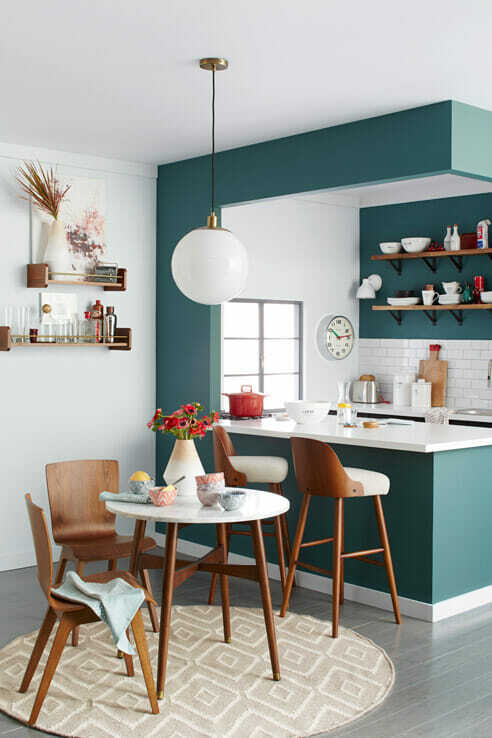 Our friends at Paintzen, experts at providing paint color help, say “accent walls are a great way to add bold color to your space without overwhelming a room.” Check out the power of an accent wall in a small environment like this modern kitchen dining space. They’ve opted to paint the partial wall separating the two spaces a deep green blue, and they’ve extended the pop of color onto the kitchen’s far wall. The bright white walls and surfaces keep the space light and open, and allow the accent wall to shine. – Do paint the trim the same color as the wall. This will help make formal trim feel more contemporary. If you have a lot of trim and wood detailing on the wall it will add instant texture. The eggplant hues used on this formal living room keep the space from feeling overly traditional or dated. 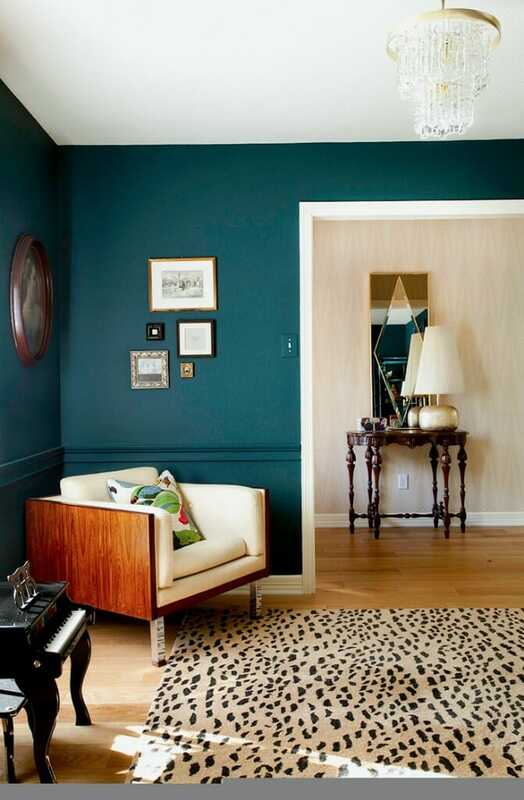 This post has more tips on how to use living room paint colors to make a space more contemporary. – Don’t get matchy-matchy. This look isn’t about using typical color pallets, it’s about bringing the unexpected into your space in new and exciting ways. Use reds, yellows, blues and pinks together. If you are worried what you are putting together doesn’t match, you are probably on the right track. 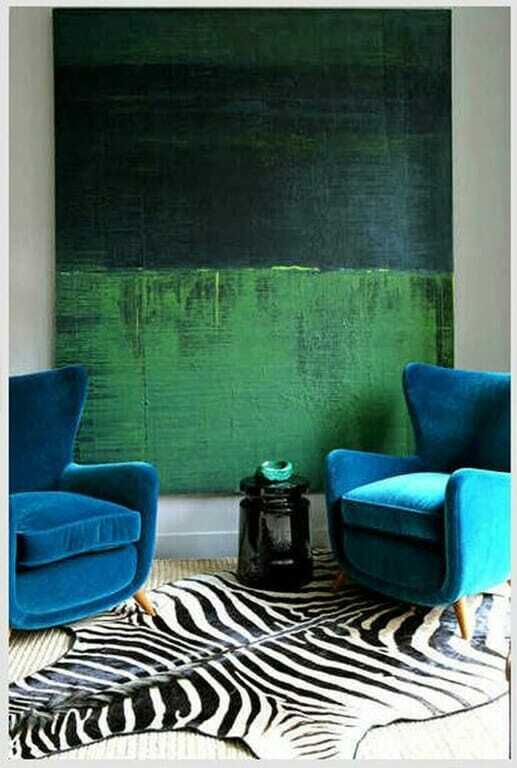 – Do use neutrals to make your saturated colors sing in the space. Add in blacks, grays, whites or ivory for a visual break from all of the awesome color in your room. This will actually make the vivid additions to your room more impactful. 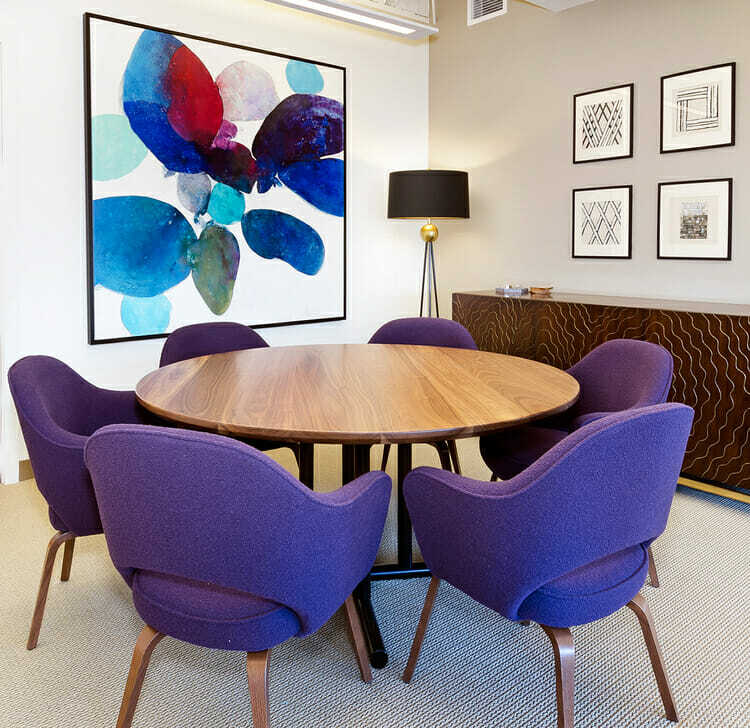 – Do use rich bold furniture and accessories to infuse saturated colors into your space. This look isn’t only about adding paint to walls or furniture—it’s also about brilliant upholstery pieces and dramatic artwork. 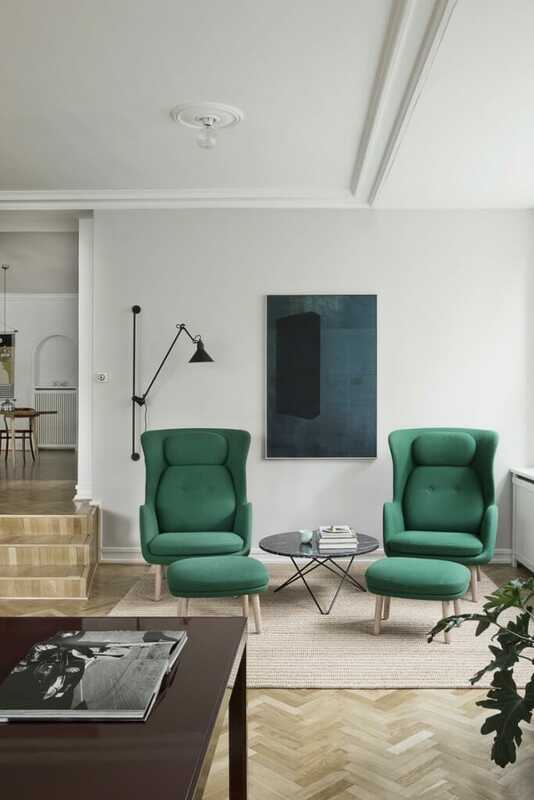 If you’d prefer to leave your walls totally white, then you can throw in a splash of rich color use a stunning set of chairs and combine them with the perfect piece of artwork. Adding color is definitely one way to get out of a decor rut; we love this HGTV post that shares more on that. Still, taking the paint plunge can be risky. With a Decorilla designer to assist in color consultation and paint color help, the assurance of a room coming to life is well worth the risk. Written by Decorilla Designer Tabitha M.